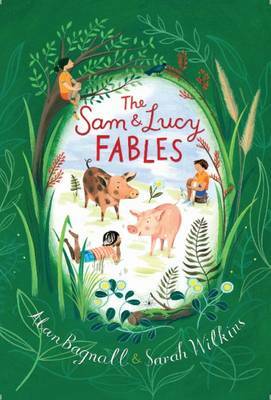 The Sam & Lucy Fables shares the adventures of two clever pigs, Sam and Lucy, who are always keen to help their human friends in peculiar predicaments. From fixing magic carpets to teaching fish to read, Sam and Lucy solve each conundrum with some common sense and a lot of patience. Each fable reminds us to be kind, curious and a little bit adventurous. Where would we be without Sam and Lucy? We'd be very lost! The Sam & Lucy Fables is a collection of quirky tales and engaging illustrations that will be treasured for years to come. Alan Bagnall is one of New Zealand's most illustrious writers of children's fiction and poetry. For over twenty years, he has contributed to Learning Media publications, including the School Journal and the Ready to Read series. His poetry has been published in 100 New Zealand Poems for Children and I'm a Big Bag of Bones and Other Poems. Alan's previous book, The Immigrants, was a finalist in the New Zealand Post Children's Book Awards and listed as a Storylines Notable Picture Book in 2003. Sarah Wilkins is an internationally acclaimed illustrator renowned for her whimsical and elegant style of art. Her work has been featured in hundreds of publications and has made its mark on everything from buildings to accessories. The Immigrants, which was her past collaboration with Alan Bagnall, won the LIANZA Russell Clark Award for Illustration in 2003. Sarah's work on children's books includes A Book is a Book, which won the Storylines Notable Book Award in 2014.